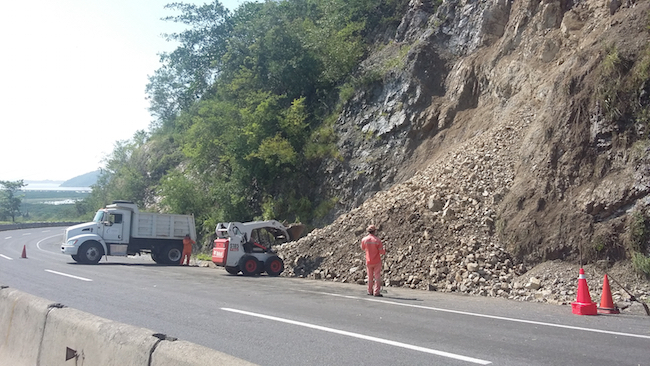 Hurricane Patricia caused minor landslides on the highway from Guadalajara to Manzanillo. Mexico escaped with minimal loss of life as Patricia, the strongest hurricane ever recorded, slammed into its Pacific coastline last Friday night. Although there were initially no reports of any casualties, EFE stated on Sunday that two people were killed by a falling tree in the town of Tapalpa in the western state of Jalisco on Friday night. The victims, who had been camping in the forest, were named as Andrea Fabiola Aldrete, 45, from Argentina, and María del Carmen San Miguel, 61, from Coahuila in northern Mexico. That afternoon another four people were killed in a traffic accident on the highway between Guadalajara and Colima city, the respective state capitals of Jalisco and Colima. I went on The World with Marco Werman on BBC World Service/PRI radio yesterday to discuss the impact of Hurricane Patricia. Click here to listen (skip forward to six minutes in).